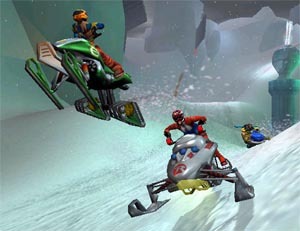 Sled Storm is the next instalment of wild snow games from the makers of SSX Tricky. 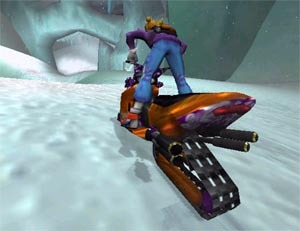 The idea behind Sled Storm is to race high powered snow sleds across wickedly dangerous terrains. You must also perform spectacular tricks in order to gain points that can be converted into turbo boosts. You get to choose from an array of "cool" characters. 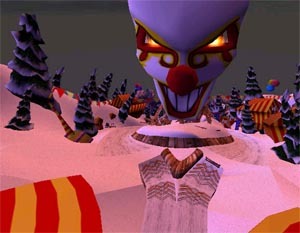 As with the SSX Tricky games, the developers have gone to extreme lengths in getting the right voices for each character. Every character is different, annoying, fun and helps give the game an edge that will surely make this one popular title. One of the characters is Tracey Maretti who is a very lean and cute 27 year old who specialises in a strategic riding style with a medium assortment of tricks. The more you play this title, the greater amount of character choices you have. For example, later on in the title, you will be able to play Sam Griffin who is a very cool 21 year old who's riding style is extremely reckless but fun. His trick capability is extremely high which means you can pull off some wildly amazing tricks. Although you cannot access all the characters from the beginning of the game, you will be able to race against them all. Be careful of expert racers such as TJ Rallins who's riding style is very aggressive. These AI opponents will do their hardest to mess your perfect run. Once you have selected your character, the game starts with a beautiful in-game cinematic of the track you are about to play with a voice over from the commentators. 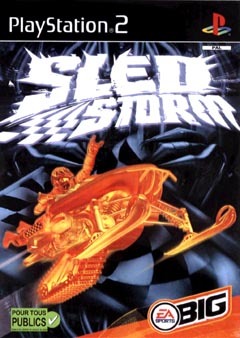 This highlights the brilliant graphics of this title and even though this game uses a modified version of the SSX Tricky engine, its still the best damn engine there is. The terrain detail is spectacular, from awesome lighting effects, trees, rocks, tunnels, ice and a wide variety of special effects. The detail of the players is great and everyone has a unique feel and play to them. The controls of Sled Storm is extremely easy to pick up and after one or two races, you will be ready to take on almost the best racers. The premise of this game is to win but thankfully with the help of performing tricks, your points are turned into turbo boosts (storm boosts). The more tricks you pull off, the more times you can you use your turbo powered race sled. This is a neat effect when you use it, the controller shakes and the screen goes into motion blur. Be warned though, if you fail to pull off a trick, you'll witness a spectacular crash that may cost your position. There is a variety of different game modes that will guarantee a long playability. One of them is the Time Trials that lets you race with one or two players on any unlocked course. Practice lets you play any unlocked course so you can get the hang of the course or test out different tricks. The Multi-Player option lets you play against a friend in either a Quick Race or Time Trial mode. Championship mode is one of the best game modes as it's the only way you can unlock new tracks, sleds and characters. The final game mode is the Rival Challenge but you must first win in Championship mode. This mode lets you race against the best players but the odds are higher, if you lose a race, you lose your sled. As you can see from Sled Storm, the game play value is extremely high so you'll be playing this title for awhile. The music of Sled Storm has a great hard rock feel to it which really suits the title. There is a wide variety of bands that have performed tracks for this game from the Overseers to Project Wyze. Sounds and character voices are all top class. Overall, I would highly recommend this game to anyone who owns a PS2. Its a fun fast title that will ensures hours of fun. The beauty of this game is that the controls are easy to pickup and the more you play, the more tricks and styles you will learn. Highly Recommended! EA Sports has done it again!